This is a combination of memoir, women's lit, and self-help book. 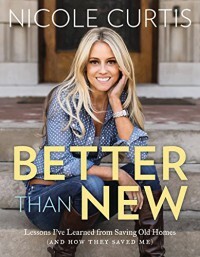 Nicole tells all about each of the houses she's renovated for her TV show, Rehab Addict. In the course of each of these rehabs, she's gone through a lesson. The lesson has taken on the name of the house. My favorite, I think, is the Dollar House.The house had been tagged for demolition by the city. When Nicole took over the house for rehab, they had to have money change hands for the records. So a price of one dollar was assigned. Thus it became the Dollar House. The house had to be lifted off its rotted foundation and have a whole new foundation done underneath it, then be set back on the new foundation. In her own life at that time, she was having to rebuild her life and reputation from the ground up. She had to prove that she could stand on her own and do it all, without a partner to help her. She plans and reacts and gets the job done standing on her own two feet. Nicole writes as if she were simply sitting down talking to you about theses things. She pulls no punches. When things went wrong and it was her fault, she says it was her fault. When it's someone else's fault, she lets you know that. When it's no one's fault and just an accident, she doesn't try to place blame on someone, she just says it was an accident and life happens. She's a very creative person and has an upbeat outlook on life. So reading this was really great. She doesn't get bogged down when things don't go smoothly, she looks for solutions. This is why I called it partly a self-help book. There is much to be learned from the way Nicole deals with setbacks. She just doesn't allow them to hold her back. She looks around and figures out a way to get the job done. I found myself really wanting to sit down and have coffee with her and talk and talk and talk. She'd make such a great friend! So pick up a copy of this book and read all about these rehabs and how this amazing woman found solutions to some of the strangest problems a person's ever had to solve. Due in bookstores December 16, 2016. A great Christmas present for your favorite DIY-er. I was provided with a digital copy of this book without any of the photographs by Artisan and NetGalley in exchange for an honest review. I cannot speak to the photographs, just to the text of the book. I am not being compensated in any way. All opinions are fully my own.